Unique Moments Photography of Gig Harbor Washington was truly honored to capture this FIP wedding in Tacoma Washington. FIP stands for Focus,Intensity and Passion. This could not be more fitting for these two. The plan was simple. They were going to go to a pier on the Tacoma water front on a lazy Sunday afternoon, get married, and then go to the Social bar and have a nice little party with family and friends. So we said to the bride . Let me see if I got this right. No reservations for the pier ? Nope its a public pier. What time and where on Sunday because the waterfront is usually packed on Sundays ? Sunday afternoon at 4PM. Anything else I should know about? Well, my dad is taking me to the wedding in his boat. We are just gonna dock the boat, get married and head to the Bar for a party with family and friends. Perfect. Sounds like this is going to be Fun. The plan was simple. We were going to sit back and just watch and let it all unfold in front of us. The day started off with the bride getting ready at her family home that was built and lived in since the 1930’s in Tacoma. After she was dressed, we headed over to point Defiance Park for a First look and some formal photos. The bride was absolutly Stunning in her dress and Gabriel clean up really good as well. They had a great first look and then we headed over to see her Grandmother. After a visit with grandma, it was time for the adventure. She Jumped in her father boat and everyone else headed to the pier in Tacoma. Friends set up some chairs at the end of the pier, the public quickly figured out what was going on (and cooperated) and Everyone arrived at the end of the pier. A boat idled in with a beautiful Bride aboard, and the rest as they say is History. The bride climbed up the ramp with her parents and these two lovebirds exchanged some vows in front of family, friends and the the rest of Tacoma’s best. Man talk about a ton of fun. This was absolutly perfect . A kiss for luck, a huge applause from the general public and it was time to P-A-R-T-Y. The Bride and groom jumped back in the boat for a short ride to the social bar in Tacoma and the Museum of Glass. 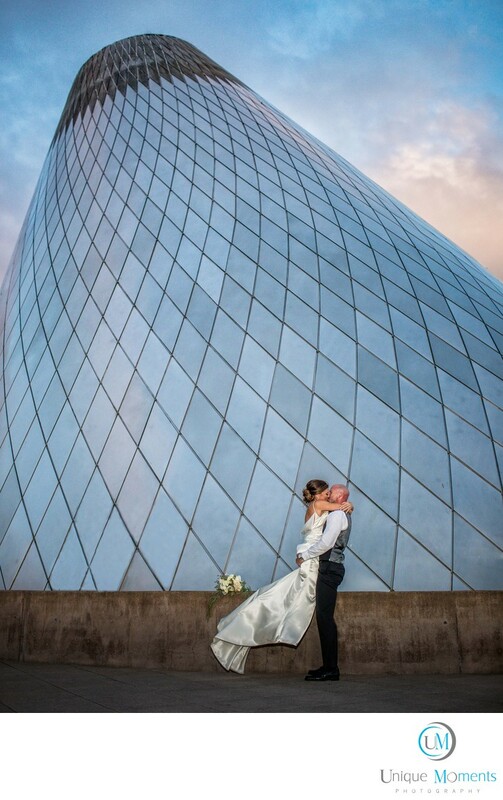 Gotta admit, we have photographed at the museum of glass a few times but not for a wedding. We knew the pictures would be awesome. The food was fantastic at the social bar. Family and friends were treated to a great Taco bar and they got to see a wonderful First dance by the couple. The father daughter and mom Son dances were next followed by a greta sparkler exit later that night. After a perfect dip and Kiss at the sparkler exit. Got to Admit. This one was perfect. Great wedding, great families, beautiful couple. A perfect day for Unique Moments Photography.